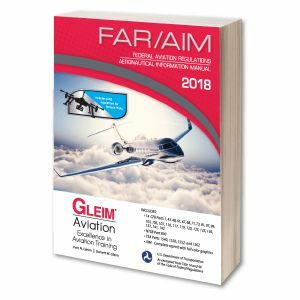 The Gleim FAR/AIM simplifies and facilitates your understanding of the complex rules governing aviation. The bigger and darker font, well-placed indentations, two-column formatting, and careful spacing are designed to make it easier to read, learn, and understand. A comprehensive FAR index in the front of the book and an AIMindex at the back make it easier to find pertinent portions of the FARs and/or AIM than do government indexes. Access a digital version of the Gleim FAR/AIM here.